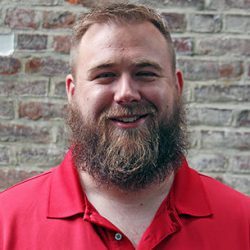 Chris Adams, president of the Penn State Berks Student Veterans Coalition and CEO of the college’s Student Veterans of America chapter, has been selected as one of only 100 chapter leaders nationwide to attend the 2018 SVA Leadership Institute. The event will be held September 20-23, 2018 at the United States Chamber of Commerce in Washington, D.C.
Adams enlisted in the U.S. Marine Corps in 2006. After being stationed in California for a couple of years, he was deployed to Iraq where he served alongside British forces. He then served in diplomatic relations, working in embassies and consulates in approximately 40 countries, including Japan, Kenya, and Germany. With the experience he gained in the Marines and the opportunity to transfer credits from courses he took while enlisted, the Security and Risk and Analysis degree at Penn State Berks seemed like a natural fit for Adams. At Penn State Berks, Adams also has the opportunity to explore his interest in a seemingly unlikely minor–Theatre. He explains that he has been interested in Theatre since high school and never had a chance to pursue it. So far, he has performed in the college’s productions of Biloxi Blues and Macbeth. Under his leadership, the Berks SVA chapter has the highest number of members in its history. He actively promotes the benefits to all students, both veteran and civilian, including the opportunity to attend SVA’s Annual National Conference. It was at this conference that he first learned about the SVA Leadership Institute. After completing the lengthy application process, writing an essay, and submitting a video, Adams was selected. He is also enrolled in an online course for the Institute through Columbia University. In addition to his work in recruiting students for the organization, he also led chapter volunteer efforts at Blue Marsh last spring. The SVA constructed a bridge across a stream that flows in the woods behind the Dry Brooks day use area. Currently, Adams is working to resurrect the SVA chapter’s TedX speaker series; the event is scheduled for November 11.